We were super lucky today on our 12pm whale watch! While over 6 different whale watching trips in the area reported not seeing any whales due to thick fog, our veteran Captain Tom led us to the northwest corner of the bank where we saw two large fin whales and two minke whales! I immediately recognized the first fin whale as Fjord, a fin whale seen as early as 1981 and believed to be male. 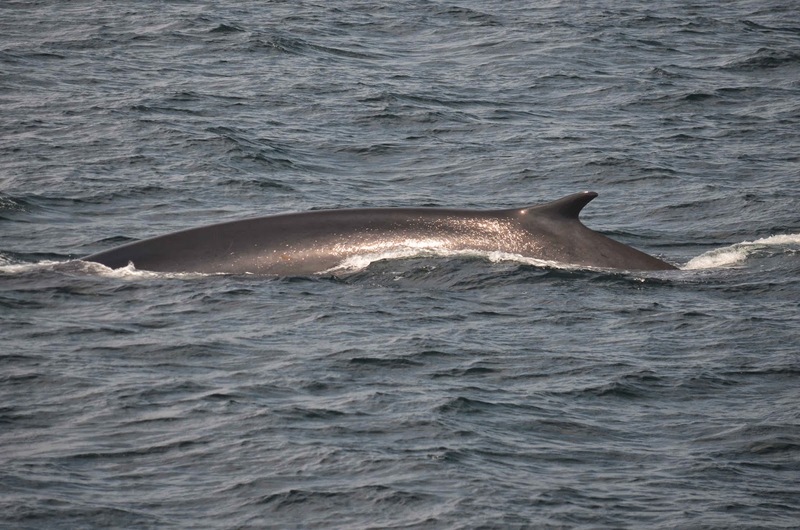 Fjord is one of the few fin whales that is easily recognizable in the field because of his deformed dorsal fin. Fjord was traveling very quickly south and at times swimming at speeds of up to 15 mph. We had beautiful views of Fjord as he cruised alongside us. Guests were able to see the dramatic differences in the coloration of the right and left side of his head. 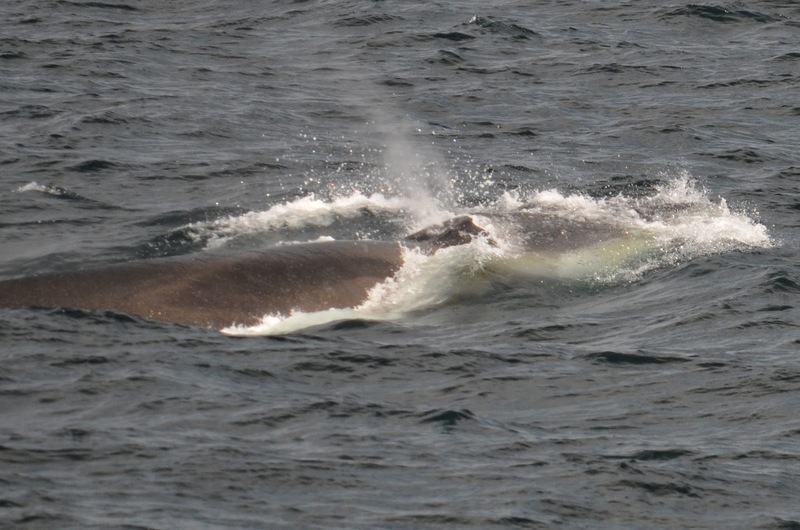 The left side of fin whales’ heads and jaws are almost entirely slate gray like the rest of their bodies. The right side of their heads and jaws including their baleen is bright white with a unique chevron pattern extending down the length of their backs. 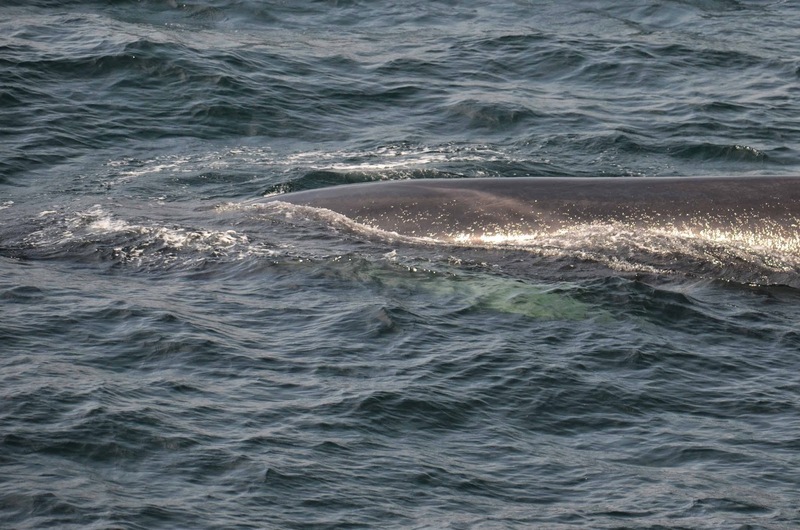 Usually, it’s a combination between these unique markings, scars, and the shape of their dorsal fin that distinguish an individual fin whale. The systematic process of IDing fin whales is not always easy and extremely difficult to do in the field. So we feel very lucky when we can identify an individual we are observing and learn more about them! Before heading on to the next fin whale, a small minke whale popped up right next to Fjord! Our second fin whale was behaving very differently from Fjord. As we slowly cruised up to it, the fin whale changed directions dramatically and started turning towards us! 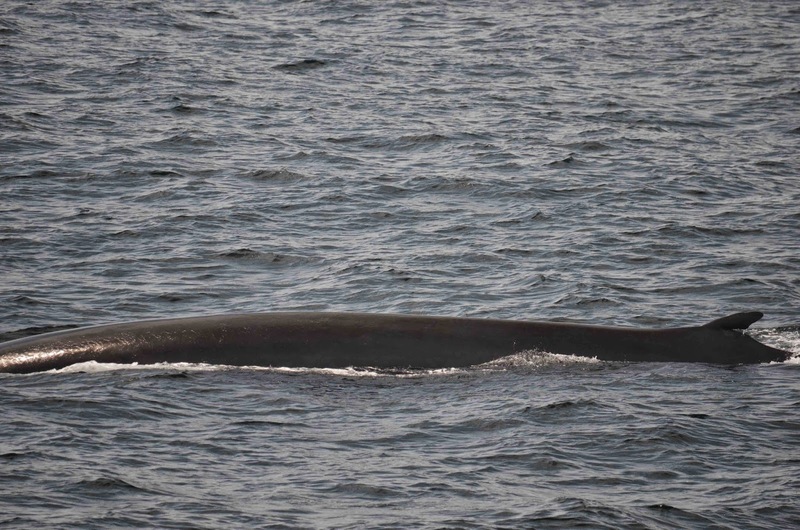 Usually fin whales are very standoffish so we were quite startled when this fin whale pulled an underwater U-turn and surfaced a minute later facing the opposite direction about 12 feet off our port side! This fin whale was particularly active and very erratic in its swimming direction and speed. Likely doing some subsurface feeding, the captain put the boat out of gear and let this behemoth swim freely around us until it appeared to be on its way. 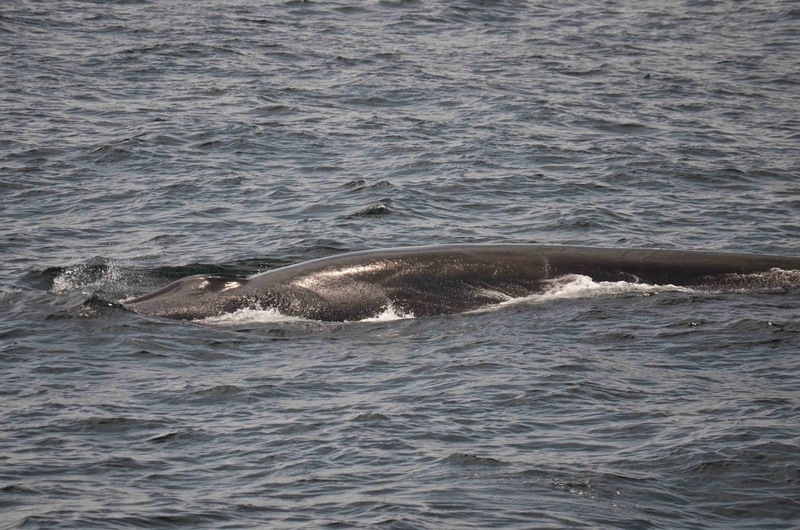 Another minke whale swam close by perhaps attracted by the same fish that drew in this fin whale! It was really exciting to spend time with both fin whales today who were very deliberate in their actions as opposed to some fin whale sightings where you can’t get a sense of what they are doing below the water. Because they can also be very illusive animals, we were extremely lucky in our sightings today! Today on board the Asteria, we headed out to the southwest corner of Stellwagen Bank. 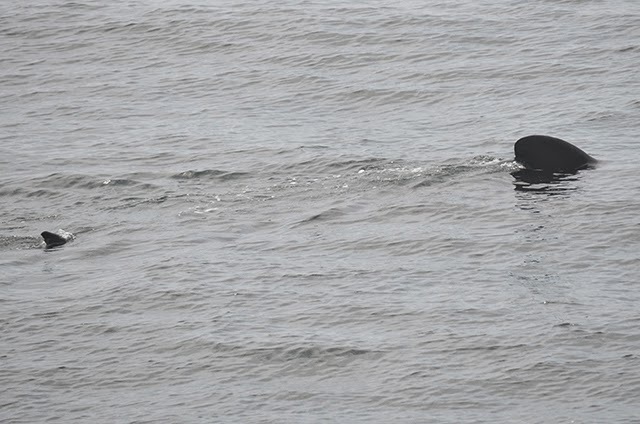 A thick fog with visibility of only a quarter mile made it difficult to spot for whales. We had a quick sighting of a basking shark (learn to tell the difference between your shark fins), but unfortunately no whales. Rainchecks were issued to every passenger.